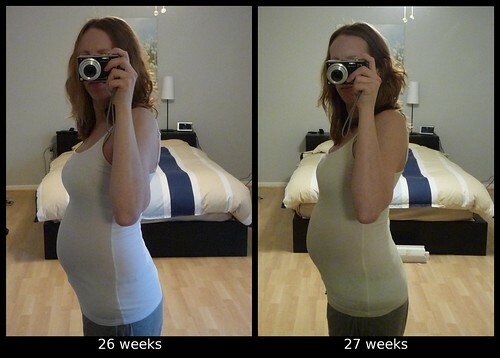 This week I went in for my monthly appointment with the midwives and the high risk doctor. This was the last of the monthly appointments with the midwives though, as I'll be going to appointments every two weeks starting now until week 36, at which point I'll begin going in weekly until delivery. I'll stay on the monthly schedule with the high risk doctor, so if all continues to go well, I'll only be seeing them two more times. I had to do a 2-hour glucose screening test with the midwives on Monday to see if I'm at risk for developing gestational diabetes. Although the glucola drink itself was fine (it was almost a pleasant orange flavor vs. the coke flavor I was expecting), the fasting combined with lots of sugar in the glucola, three blood draws and then generally feeling not so great the rest of the day wasn't my favorite. We'll go over the results at my next appointment unless there are any issues, so no news is good news in this case. 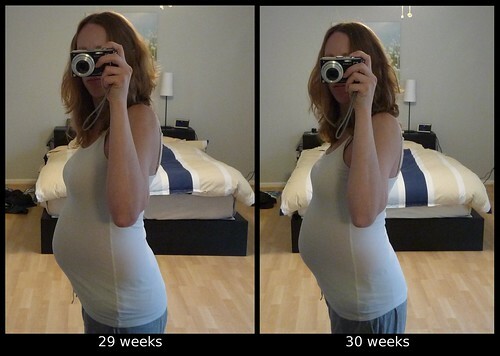 My belly measured 28 weeks, and I had a good conversation with the midwife about various birth plan and labor stuff, which we'll be talking about with our doula in the next couple of weeks too to try to nail down our preferences. 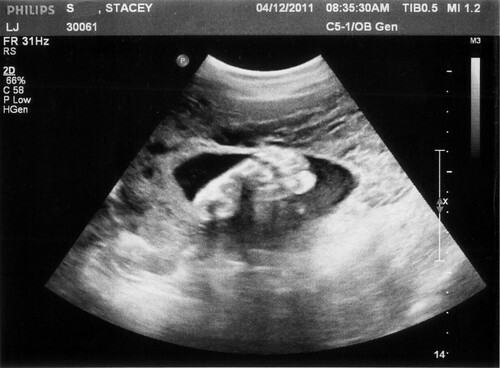 Then on Tuesday I went to the high risk doctor, and the baby got scanned and measured again. It apparently gained just over a pound in the last month so it's now at 3lbs (and possibly some change, but I can't remember), is still measuring just over a week ahead at 30 weeks and is in the 65th percentile for weight. I had a different ultrasound tech than usual, so she showed me a few different body parts from the usual in more detail, like fingers and the different leg bones. The baby also does have at least a little bit of hair now - I was surprised that we could see that level of detail on the sonogram! 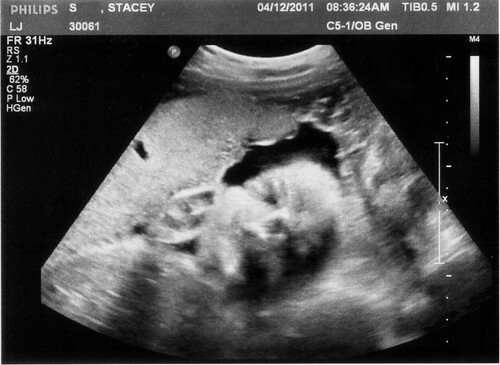 And here's a straight shot of the face - these pictures kind of freak Ryan and me out a bit since it's so ghostly and this one cut off the end of the nose (from what I understand, ultrasounds are basically showing cross-sections of the baby, so the nose got cut off because the tech was trying to get on the other side of the arm the baby had in front of its face), but I thought I'd still share it since it's a different view of the face from the usual profile shots. 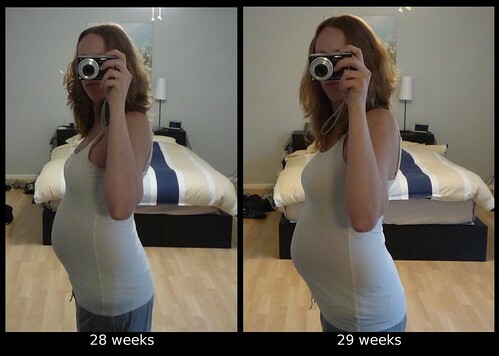 I missed a milestone in my last weekly update - as of 3/23, I'm now down to double-digits for the estimated number of days left :) Besides that, the big milestone for the week was that I finally retired my non-maternity work pants. I had been in maternity jeans for a while now, but for some reason the hairband trick was still working perfectly well on my work pants until this past week, when it suddenly was no longer comfortable. So now I'm only wearing maternity clothes except for my beloved purple pants, a couple of shirts, and a couple of other lounge pants/shorts. We are now over halfway through our childbirth classes, and we've been talking about the different stages of labor and possible complications, etc., which is making it seem more real now. Every once in a while it will hit me that I'll actually be going through labor myself in a few short months instead of just reading about it. It's also hard to get my mind around thinking about Ryan and I having a child of our own too - it's easy to think about it in theory, but it will be so strange/amazing to actually come home from the hospital with our own baby. As a side-benefit to the childbirth classes, our instructor also let us know about some prenatal massages that were being offered for free - so I got to have a free prenatal massage last Wednesday before we headed off on our last vacation before the baby comes :) We just spent a long weekend in St. Croix, which was about as low-key and warm as could be hoped for. I'll try to have some pictures ready to post in the next update, but since I'm notoriously slow with editing/culling them, they'll likely just be posted to my Flickr page eventually instead (link is to the right). 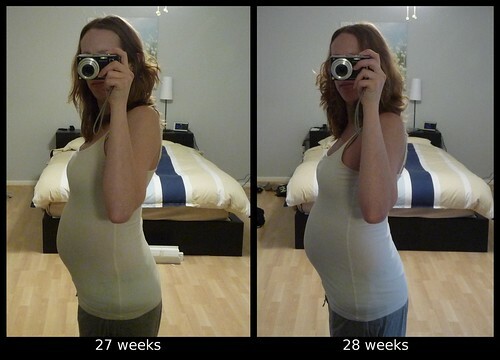 And here's the comparison picture for this week - I think I look noticeably bigger this time (especially when comparing the lower angle of my belly) when that can't just be blamed on me being closer to the camera... especially in this case, when I was closer to the camera on the older picture.